I’m not a religious person. The best label for me is probably “agnostic”: I don’t profess to know whether there is a supreme god or force. Yet anywhere I go in the world, I’m inevitably drawn to the sanctuaries where other people find their gods—the more complicated the political lineage, the better. I’ve visited monasteries carved out of cliffs in the Ihlara Valley of Turkey, where the eyes of the saints in the Byzantine frescoes had been scratched away by iconoclasts who feared the evil eye. I timed my arrival in Santiago de Compostela, Spain, to coincide with the culmination of the Way of St. James, when thousands of pilgrims from across Europe assemble before the cathedral to celebrate Christianity’s victory over Islam by ritually burning a 30-foot replica of a mosque. In Jerusalem, I was swatted by a Greek Orthodox priest herding tourists into the Church of the Holy Sepulchre. I’ve sought out some of the farthest-flung Jewish quarters in the world, visiting lonely synagogues in Buenos Aires, Istanbul, Fez, and Havana. The architecture is what drew me, but what I enjoyed most was a deeper insight into the collective will of the culture. Despite its reputation for being one of the “least-churched” cities in the country, Portland, too, has some extraordinary houses of worship: First Presbyterian, sumptuously crafted by boatbuilders; Sixth Church of Christ Scientist, arguably one of our most transcendent spaces of any kind; Temple Beth Israel, a Byzantine-styled gem; and the amazing collection of modernist churches designed by Pietro Belluschi. But the most interesting expressions of worship at this moment in Portland’s history may be happening outside traditional sanctuaries—in bars, schools, living rooms, even a laundromat—and in the multiplying conversations happening across the city about what it means to be religious. The phenomenon—known as the “emerging church” or “postmodern religion”—is certainly occurring in other places, too. But Portland’s movement is particularly ripe for exploration. We begin with “Questions of Faith”—a riveting conversation between Marilyn Sewell, minister emerita of First Unitarian Church, and Christopher Hitchens, one of today’s most outspoken atheists. We then introduce you to five local leaders in the theology and practice of the emerging church, from world-renowned historical Jesus scholar Dr. Marcus Borg to Dan Merchant, whose film Lord, Save Us from Your Followers illuminates the common ground between Americans of all faiths by politely asking questions and—a rarity in American discussions of religion—carefully listening to the answers. Portland may lack the kinds of deep religious conflicts that have shaped the sites of worship I’ve visited. 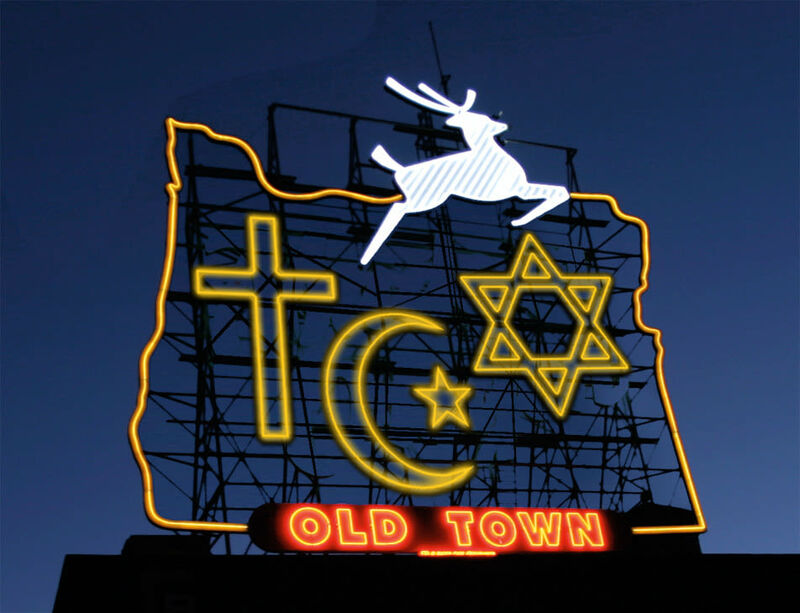 But given the secular/religious clashes that continue to shape so much of the world, maybe our calmer, more thoughtful discussion of religion makes Portland a uniquely worthy pilgrimage site.